Kat - Tell us a bit about what you've been looking at, what sort of birds have you been studying? Keith - The birds I study are called Lincoln's Sparrows, and I study them in a high elevation site in the rocky mountains of Colorado. Kat - How does their life cycle work? If a female bird is going to lay some eggs and hatch them, what does she get up to? Keith - Well, as in most bird species, the female will lay one egg per day until the clutch is complete at usually 4 eggs, but sometimes three or five. And then during that laying period, usually a few days into it, she will begin incubating those eggs. Incubation will progress for typically 12 days or so, at which point they'll hatch and she'll raise those young for another 10 days or so before they are big enough to fledge, that is to leave the nest and gradually gain independence. Kat - So we've got eggs being laid every single day, so some are older than others. What did you find when you were studying these eggs? Keith - Everybody is familiar with the concept of the runt of the litter or the runt of the brood, as you already alluded to. 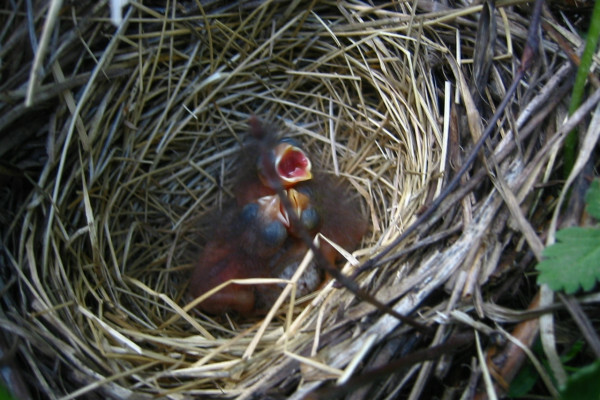 From mammals to even beetles, and especially in birds, the youngest sibling in a group of siblings, or nestlings in the case of a group of birds, is typically the smallest because it's the youngest, and therefore the least competitive in that nest and the least likely to survive, whereas the oldest is typically the largest and the most likely to survive. But what I found in the Lincoln's sparrow is that although, indeed the oldest is typically the biggest and most likely to survive the competition between it's sibling nestlings for food, it is actually the first produced young, that is the oldest, that is least likely to hatch from the egg at all. So there seems to be this trade-off that's mediated by this effect of production order or ovulation order, that in one case maximises the survival probability of the nestling, but at the same time minimises the survival probability of the embryo. Kat - So you have the older eggs which may not hatch at all. Why do you think this happens? Keith - Well, my hypothesis is that it relates to the fact that I mentioned earlier and that is that the female does not begin incubating those eggs right from the start. So that first laid egg will typically sit in the nest for a few days, often, before she begins incubation in earnest. As a consequence, that egg is exposed to ambient temperatures. During that time it can accumulate harmful bacteria and fungi that can penetrate the shell, we presume, and compromise the viability of the embryo. Kat - So presumably you're going to end up with fewer eggs hatching, but they're more of the same age? Keith - Well, we think that this behaviour of the females, which is to start incubating after... not right away in other words, kind of balances a series of trade-offs she faces. One being how many eggs can she lay before the probability that one is exposed to ambient temperatures for to long and therefore it's survival being compromised. Kat - So it's swings and roundabouts? Kat - Do you think this is happening with any other bird species out there? Keith - I would certainly think so. I think this hasn't been looked at too closely so we're not really sure how widespread it is, but I have no reason to think that the Lincoln's sparrows that I study are very much different at all from many other small songbirds.